While he has never written for us, Gavin Ashworth’s work has appeared on more Antiques and The Arts Weekly covers than most artists. That is because the England-born, Manhattan-dwelling studio photographer is routinely contracted by some of the United States’ leading museums, dealers and collectors to capture images of the finest art and objects that the country has to offer. We caught up with Ashworth to talk about his work, new techniques and how many pounds of equipment it takes to get the job done. What did you shoot before you started working on antiques and art photography? I was in partnership in a London photo studio before moving to New York. We specialized in Industrial/Advertising photography shooting both in the studio and on location. In the studio we primarily shot onto 8-by-10 color transparencies and we had the luxury of an in-house color processing lab. On location, we would either shoot industrial situations or, as I remember one shoot for White Horse Whiskey, hanging out of a helicopter chasing a White Stallion across the Scottish Highlands. All very exciting for a young photographer, and it helped me win two of England’s highest photography awards: a Fellowship in the Royal Photographic Society and a Fellowship in the British Institute of Professional Photography. I became heavily involved with multi-projector industrial shows where 30-60-90 or more projectors were linked through a computer to present widescreen presentations. I became well-known in this field and was invited in 1982 to join a large industrial shows company based here in New York City. During this time, I was asked by a friend to shoot an ad for Magazine Antiques and I asked for a credit line. That credit line is probably responsible for where I am today. My mentors are the photographers that I assisted after leaving College of Photography, watching, learning and always testing new ways to achieve the ultimate shot. It’s all about lighting and getting that natural light appearance with room interiors or raking light on a piece of furniture to accentuate a carving detail. I’ve developed a unique technique using digital to register multiple shots together in photoshop, so that light in a room shot appears to be coming from the windows or a large case piece of furniture can be shot in situ with the end result looking as if it was moved onto a seamless backdrop with its own natural drop shadows below. I call it painting with light. What’s in your studio right now? My studio is a location studio that I carry in the back of my truck and set up in each of my client’s locations. I once wheeled my cart onto a weigh machine at the Milwaukee Art Museum and was shocked to find that I carry 800 pounds of gear – a lot of it is backup equipment in case something fails. I always come back to the job, there is no such thing as failure. Even though these things are inanimate, I imagine sometimes you have to get creative with how you shoot them. I love to experiment, and the digital world offers so many exciting possibilities, like unwrapping a Hong bowl so that the entire circular decoration can be viewed in one image. Using lighter fuel on a pile of logs in a fireplace to light a room with its glow – you have to be fast as it only lasts for about 30 seconds. Using motor drive to capture a drop of slip being added to a piece of ceramic decoration. I could go on but needless to say I’m always looking for that bit of excitement to add to a photograph. What was the most challenging thing you’ve ever photographed? Probably being dropped onto a super tanker that had gone on the rocks off the French Coast to photograph for an Industrial gas company that had been contracted to use their Oxy Acetylene cutting gasses to dismantle the ship. But there are many challenges and new ones every day, thankfully none quite so dangerous in the decorative arts field. Probably standing on a ladder or atop a scissor lift during the Georgia O’Keeffe shoot in Santa Fe for the Brooklyn Museum is about as risky as it gets these days. 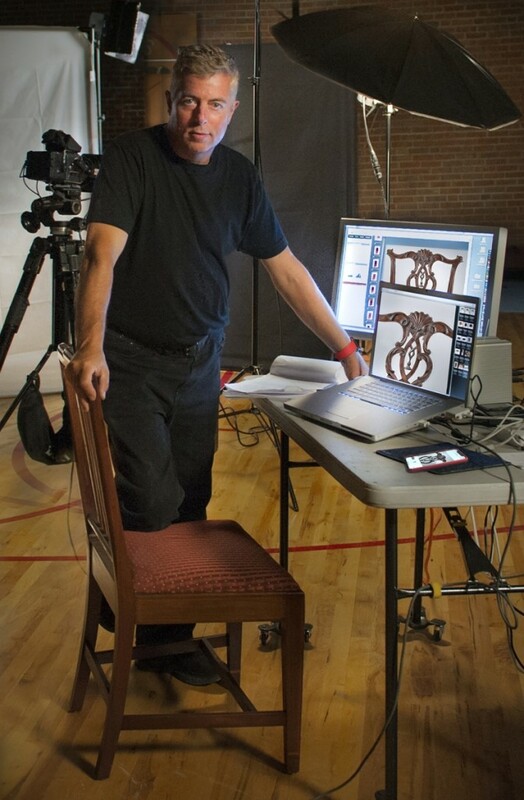 I constructed a double setup in the museum to shoot O’Keeffe’s textiles so that the stylist could work on a second set while I captured the previous setup. I was also allowed to shoot in her two homes, mainly using available light, which had the best quality I’ve ever experienced. It probably explains why she lived there. I drove the 4,000 mile round trip so as to make sure I arrived with my equipment. 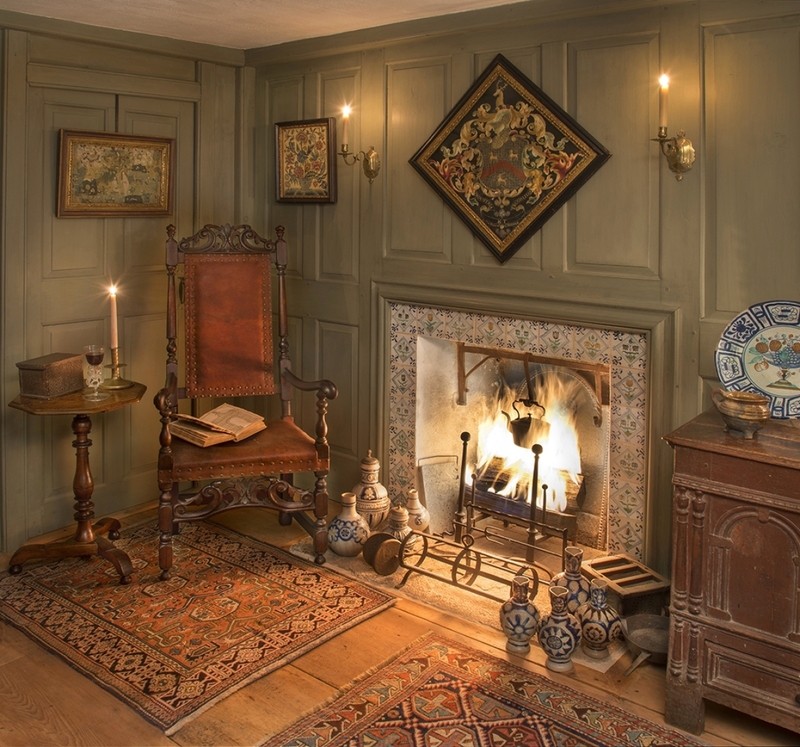 A private collector’s interior featuring stoneware, Oriental rugs, needlework and early furniture. Ashworth used the light from the fire to give the room an authentic glowing effect. What’s the best tip you ever received in regards to studio photography of art and antiques? Never ever accept second best or say, “that’ll do.” The standard you set for yourself today becomes the norm for tomorrow. Now that everything is digital, do you miss film? I can answer that quite simply by asking you “do you miss the typewriter, carbon paper, tippex, white out, no spell or grammar check?” I sometimes have nightmares or daymares that digital has been replaced by film and I have to go back to shooting dozens of Polaroids until the lighting was as near perfect as possible but never perfect. I’d retire immediately. Paul Strand, Edward Weston, Man Ray, Dorothea Lange, Robert Mapplethorpe, Cindy Sherman, Annie Leibovitz, Ansel Adams. And what about your personal pursuits? Are you engaged in photography as an artist? I prefer not to call myself an artist since I’m photographing so many outstanding pieces of art that have been produced by incredible artists. I’ve been given the opportunity to photograph America’s best. A photographer once said, “If you want to take better photographs then stand in front of something more interesting” – I’ve been given that opportunity and I’m on a Quest for Quality. Jim Rohn said, “If you are not willing to risk the unusual, you will have to settle for the ordinary.” The simple answer is I enjoy photographing boats under sail in the summer and especially storms on the water.